We research organic and inorganic materials for highly efficient and affordable solar cells (Dye sensitized cells/ Perovskite cells) instead of silicon based solar cells. 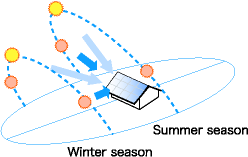 When you attach to a roof, large power generation achieved in a year total because the solar cell can generate power from slanting rays of light. The solar cell can generate power with high efficiency by reflecting light from grand and diffused light in cloudy weather. Also, the solar cell can even generate power under interior lighting. Light can be transmitted in Dye Sensitized Solar Cells by changing the size of titanium oxide particles which makes them useful at Earth’s poles. In this case, the generating efficiency is reduced. However,this solar cell can still generate power using light the same way that stained glass absorbs light; through combining several color sensitizing dyes. In the manufacturing process, high vacuum and heat is not needed meaning the environmental impact is kept at a low. 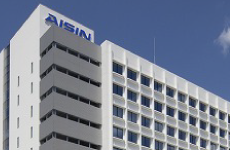 Then we are also able to create flexible cells which substrate by resin films. Dye-sensitized Solar Cells absorb short to long wavelength light. We focus on developing efficient Dye-sensitized materials and combine them with cell component technology which exhibits Dye Sensitized features. 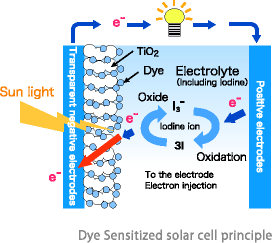 ① As sensitized dye absorbs light, an excitative electron is given off to titanium oxide on transparent electrodes. ② The electron is transferred through the transparent light electrodes to counter electrodes. ③ The electron is then transferred back through Iodine reduction and oxidation in an electrolyte. We do research on and development of high performance high durability and affordable hole-transport materials based on pigment technology for Perovskite Type Solar Cells. 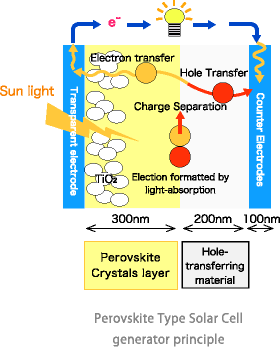 ① Light-absorbing layer(Perovskite crystals) absorb sun light and form excitons. ② Electrons are transferred to counter electrodes through transparent electrodes. ③ The transferred electrons then bind with the holes. A biological organism will absorb sugar and reduce CO2 through a complex organic system using enzyme reactions. We do research and development on “ Biofuel Cells” which uses sugar like glucose as propellant for generators that use high efficiency energy cycle systems. We do research and development to generate technology which is sugar and an organic acid from targeting nonflammable fuels.